The city of Utrecht is located centrally in the Netherlands, with a population of roughly 330,000 inhabitants. Its city centre features many ancient structures and buildings, some of them dating from the High Middle Ages. The name ‘Utrecht’ stems from Trajectum (a river crossing), the name of the fortress that the Romans built on the river Rhine, which at that time followed a more northern course. The Romans left the region at the end of the third century; since the 8th century Utrecht has been a major religious centre. In the 12th century Utrecht received city rights and soon defence walls were erected and a city moat was dug. As a result of a heavy storm in 1674 the nave of St. Martin’s cathedral, the main church of Utrecht, collapsed, thus creating an open space, where at present you find the Dom square, with the 112 meter high Dom Tower standing on its own. It is possible to visit the Dom Tower and climb its 465 steps (no elevator), to be rewarded with a magnificent view of the city. Utrecht was the most important city in the Netherlands, till that position was taken over by Amsterdam in the Dutch Golden Age (17th century). At the Dom Square a number of underground remnants of the Roman Castellum can be visited. A special feature of a number of canals in Utrecht is formed by the wharves and wharf cellars. The wharves were built as an inner harbour system when the old riverbed was canalized. The wharf cellars were storage facilities. At present many of these wharf cellars are in use as restaurants. The Rietveld Schröder House was built in 1924 by the Dutch architect Gerrit Rietveld. It is an excellent example of the De Stijl architecture. The Central Museum has a large collection of Rietveld objects. But also work of the so-called Dutch followers of Caravaggio, the 17th century painters Gerard van Honthorst and Hendrick ter Brugghen. Museum Speelklok has a large collection of automatically playing musical instruments. Most of them are still in good working order. There are small musical boxes, but also the typical giant Dutch Street Organs. The University Museum is housed in the former Botany buildings, near the Dom Square. At the back of the museum is the former Botanic Garden (Oude Hortus) with the oldest still existing academic greenhouses in the Netherlands (early 20th century). An impressive tree is the 250 year old Gingko biloba, one of the oldest gingko trees outside Japan. Due to its central position Utrecht is a major hub of the Dutch railway network. From the large new Central Station trains run to all major cities and towns at least twice an hour. 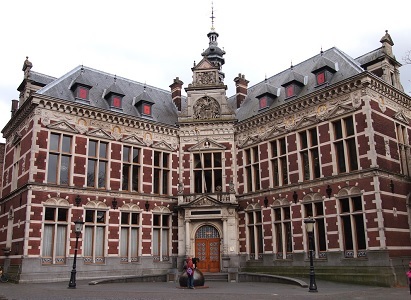 So it is relatively easy to visit Amsterdam with its historic city centre and famous museums (e.g. Rijksmuseum and Van Goghmuseum) or Rotterdam, famous for its stunning modern architecture and the largest port in Europe. Utrecht University Utrecht hosts the largest Dutch university; Utrecht University, founded in 1636. At the moment there are more than 30,000 students enrolled at the university, in seven faculties: Geosciences, Humanities, Law, Medicine, Science, Social Sciences and Veterinary Medicine. The departments in Science are Mathematics, Biology, Chemistry, Physics and Astronomy, Information and Computing Sciences, Pharmaceutical Sciences. The development of the university campus, de Uithof, started in the sixties of the 20th century. The Uithof is situated east of Utrecht and also contains the Hogeschool Utrecht (vocational university), the academic hospital, the university library and the botanic gardens. Some faculties still use the buildings in the old city centre. The conference is in one of the rooms situated in an extension of the historic University Hall, on the first floor, the Kanunnikenzaal (room of the Canons). The oldest part of the University Hall is the auditorium or chapter house, dating from 1462 and originally part of the large Dom church. In the auditorium in 1579 the Treaty of Utrecht was signed by the seven Northern provinces of the Low Countries. This treaty is considered the origin of the Dutch Republic, since the early 19th century the Dutch monarchy. In 1886, when the University celebrated its 250th anniversary, the inhabitants of Utrecht offered the present University Hall to the university. The Hall was built in Dutch renaissance style, adjacent to the old auditorium and with connections to surrounding buildings.